We moved into our new home in May 2017. One of the best features of the home is its open floor plan – perfect for hosting a New Year’s Eve party! Planning and hosting parties is one of my favorite things to do, but it takes work, vision and resources. Before my husband and I had kids, we ALWAYS went out for New Year’s Eve. Its always been one of my favorite holidays to celebrate. I love getting dressed up, I love the festivities and celebration of friends, family and life. We even got engaged on New Year’s Eve! Since we’ve had kids, the appeal of going out has diminished. Not because we don’t want to celebrate, but it’s challenging and expensive for everyone to find a sitter. Our good friends, Matt and Gina, have hosted a friends with kids party in the past and it was always a win-win solution. We can celebrate with our friends, our kids can celebrate together, no one needs to drive and we all crash there for the night. Perfect. This year, Gina suggested (kindly:) that we host this year. After we agreed, I invited our friends and their kids over to our house for New Year’s Eve. Most readily accepted! The first thing I do when planning any type of party is compile my guest list and get a solid headcount 4-6 weeks before the party date. I choose not to send formal invitations, but instead managed the party details via group text message since the list was small. Next, I search Pinterest for New Year’s Eve party decorations and a ideas for fun kid-friendly activities. I like to pin themes, colors, decorations, activities, and anything that will help me build the theme of the party. 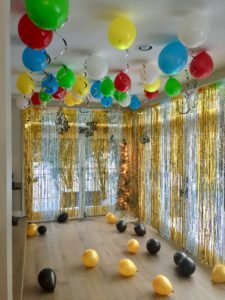 Since its New Years, the decor was color-based – gold, silver, white, and black. I found some great items at Party City, Oriental Trading Company and Amazon. I didn’t need to order 4 weeks early, but I found some great Cyber Monday deals that scored me at least 25% off and free shipping, so buying early isn’t a bad thing! After my guest list was confirmed and decorations ordered, we decided a potluck would be the simplest and affordable option for serving our guests. We all needed dinner and snacks to keep us going until Midnight! We had everything from ribs, macaroni & cheese, taco dip, cheese platter, pudding jello shots and cookies. There was so much food! When going the potluck route, I like to prepare the main dish and then allowing guests to bring their favorite appetizer, side dish or dessert. This allows for a variety of favorites and rounds out the meal. We also had a lot of alcohol on hand as well. 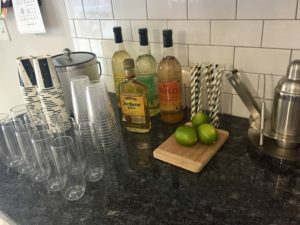 Everyone brought champagne and I also set up a bar with BE MIXED drink mixers. These are great for a zero-calorie, all natural alternative to some of the traditional sugary mixers. Set up can be the most stressful part of hosting a party. I like to start the day before and get as much done as I can while the kids are napping or after the go to sleep. Fortunately for me, I was able to get 75% of the set up completed the day before. TIP: using this approach, you’re able to ensure you have adequate time to make a last minute store run if you run out of hanging supplies i.e. tape, glue, clear wall hangers, etc. Manage your time appropriately. Lay out your to-do’s and work back from the party start time to see when you need to shower, get dressed, put the food in, etc. I cut it a little close this time, hanging the last balloon at 5:30pm when my guests were scheduled to arrive. A little planning can go a long way in allowing you to relax and enjoy your party! I’ve been planning and hosting parties for my kids for a few years now and every time I get better at it because I’m more productive and take care to plan my time. We had a GREAT New Year’s Eve this year! The kids love the festive decorations and, thanks to Netflix, we even watched a fun kids New Years countdown from King Julian from Madagascar. We stayed up way too late, as did the kids, so New Year’s Day was spent snuggling on the couch watching movies together and eating Chinese food. 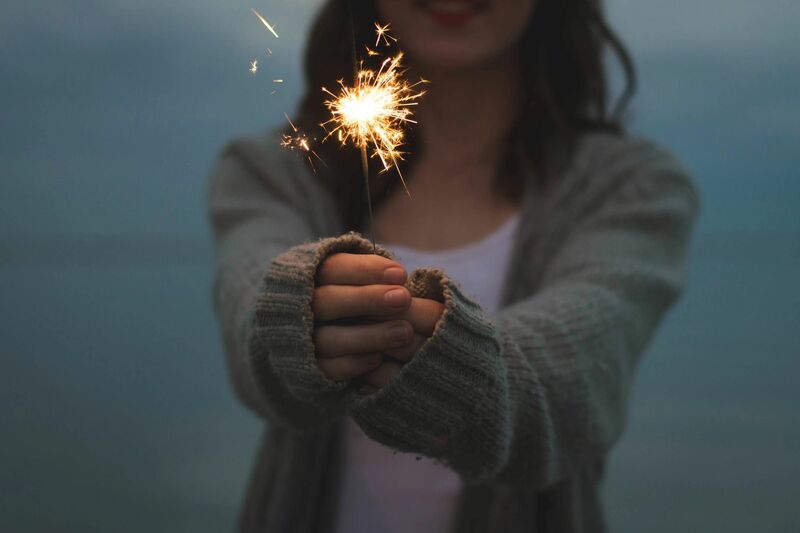 Hope your next New Year’s Eve party with kids is amazing!